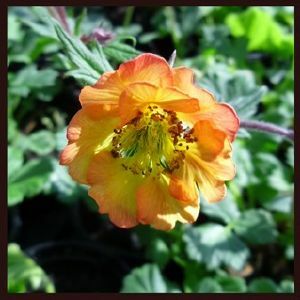 Geum 'Hannay's (Double) is a compact perennial forming a neat mound of dark green foliage, with coppery-orange double flowers in early and mid-summer. It flowers best in full sun and will cope with dry soil. Combine with complementary yellows and reds to add fireworks to your colour scheme! Geums are reliable perennials loved by bees and a must in any cottage garden scheme. They produce flushes of flower from April to the end of July, depending on variety, and are classy selections that looks good even in bud. They work great with Heuchera in part-shade but are equally happy in sun.